In the process of learning today’s—admittedly self-indulgent—post, I turned myself into a proverbial lab rat, got paid $50, and much to my surprise, learned an important lesson in research methodology. It all began a few months ago when my colleague, Dr. JoAnne Arcand, created the Salt Calculator, a simple online tool that allows anyone to quickly calculate their sodium intake (by the way, I encourage you to check it out: http://www.projectbiglife.ca). 2) The equally self-explanatory but substantially grosser, 24 hour urine collection. You heard me right, because excess sodium is excreted in urine, the best way to measure sodium intake is to collect your pee for 24 hours! By now you can probably imagine how I fit into this story…being slightly sodium obsessed, I’ve been looking for an opportunity to get an accurate measure of how much sodium I consume. So naturally, I couldn’t resist…I enrolled myself in the study. While collecting my urine for 24 hours was unpleasant, there was something else about the experience that I found even more displeasing…I was shocked by my own laziness when it came to the 3-day food record!!!! You see, when I enrolled in the study, the delightful research assistant gave me a thorough schooling on the procedure that I was to adhere to. Those of you who know me, know that I’m the kind of person who typically follows instructions. Nevertheless, despite the fact that I’ve been teaching undergrads about the proper procedure for recording food intake for years, I found myself falling victim to the classic blunders: not recording my food as I ate it, not measuring my food, and worst of all, letting the fact that I’m supposed to record what I eat influence my food choices. Despite my utmost respect for the research process, I was a mildly non-compliant subject! While I feel guilty and embarrassed, the purpose of today’s post is not for me to seek absolution from my readers, but rather, I’m telling this story because my experience was surprisingly educational. You see, it’s a well-accepted fact among nutritional scientists that our ability to measure food intake is bad. But despite the fact that I’ve long known this, it wasn’t until I became a participant on the other side of the research process that I deeply understood the degree to which our inability to accurately measure food intake undercuts nutrition research. How can we confidently link a disease outcome with diet if we can’t accurately measure what people are eating? As you can see, this realization has profoundly influenced my views on nutrition research. When I enrolled in this study, I was mostly interested in learning about my own sodium intake. However, this is a classic example of how sometimes you set out learn one thing, and in the process you realize that the true lesson you’re meant to learn is something you couldn’t foresee and is perhaps something much more profound than what you expected. 1) For non-scientists…I hope that by sharing this story, I’ve shed light on one of the reasons why there is so much controversy surrounding nutrition. Research is hard to do. We as humans are imperfect, and thus in turn our research is imperfect, it’s that simple. 2) For scientists, particularly scientists-in-training…I hope that you will be inspired to turn yourselves into proverbial lab rats, you never know what you might learn when you put yourself on the other side of the lab bench. –A special thank you to Dr. JoAnne Arcand, whose study inspired this post; Zhila Semnani-Azad, for many things, including sending me my results; and lastly the FLIP girls, for being great research coordinators! 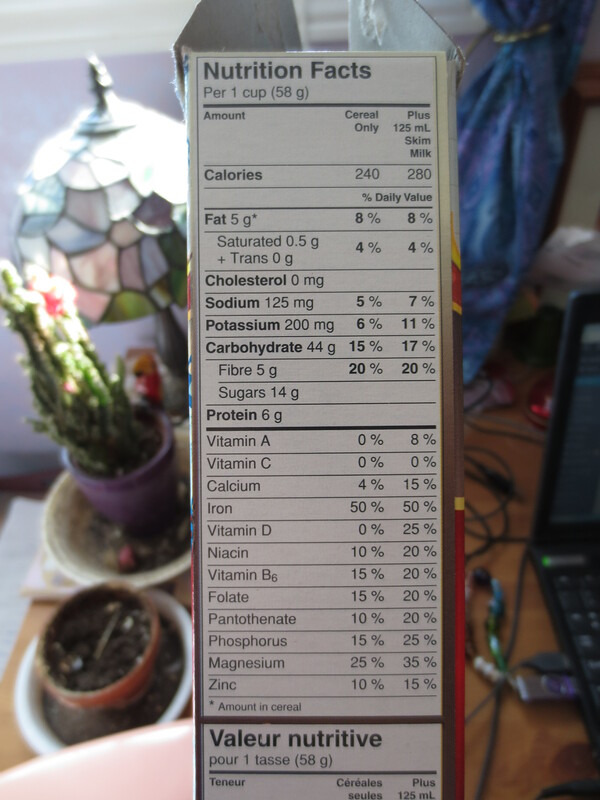 In North America we often take it for granted that we can just turn over a product and read its Nutrition Facts table. Though people often hate on the Nutrition Facts table–accusing it of being confusing and archaic–it’s easy to forget how privileged we are to simply have that information available to us. I learned about this fact from: Sampath, Janani. “Doctors Push for Sodium Levels on Food Labels” The Time of India, May 18th 2014. And thanks to Google alert, for alerting me to this fact! Those of you who know me might be shocked to hear me say this. But it is indeed a fact. Nevertheless, this doesn’t mean that those are who “salt resistant” don’t have to worry about their salt consumption. For starters, the adverse effects of salt go beyond its ability to raise blood pressure. There is some evidence to suggest that salt intake increases risk for gastric cancer, and salt is even an indirect contributor to obesity (because it makes you thirsty, and if you’re satisfying your thirst with caloric beverages, this could be a problem). Furthermore, most salty food is processed, so even if you’re salt resistant, the other adverse effects of those foods will probably get you in some other way. Not to mention, salt makes food hyper-palatable (translation: super tasty), and more salt means more cravings. So whether you’re salt resistant or not, the take home message is still the same, excessive sodium consumption is bad, and it’s something we all need to work on. I learned about this fact from: Strom et al. Sodium Intake in Populations: Assessment of Evidence. Institute of Medicine, 2013. I didn’t check every country, but it’s quite interesting to note that of the countries I chose, Canada ranks highest.